As most of you likely know Clueless is one of my all-time favorite films everrrr. 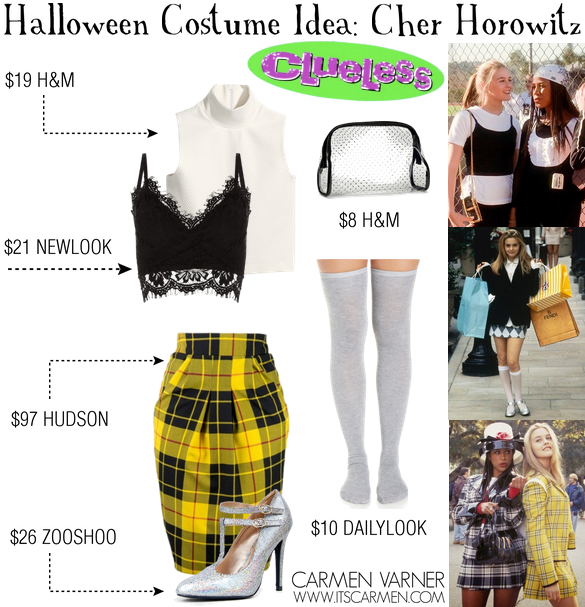 That said, it would make sense to feature Clueless's main character, Cher Horowitz, as a Halloween costume idea for women. I dug through some stills from the movie & created a hybrid outfit to emulate her style. 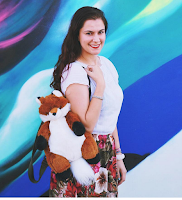 To start off this look, you're going to layer a white sleeveless turtleneck & a lacy black tank.There is leeway with the white shirt -- in the film she wears a basic white tee & in my costume it's a sleeveless turtleneck. Lastly, we want some cute silver heels paired with some knee-high or thigh high socks. Once again, there is freedom with your socks. Throughout the film, most characters wear knee socks at some time or another. The color is up to you. To accessorize the look, get a small transparent clutch to hold your necessary items like your ID, cell phone, & credit card. Now you're ready to be totally clueless. This Halloween costume idea based on Clueless's Cher Horowitz is actually pretty simple to achieve & you'll look super awesome while wearing it. Clueless is a timeless film & Cher is the perfect person to be if you're out of Halloween costume ideas this year. As if! Haha great idea! I really like that yellow plaid skirt, too! I used to love Clueless! I remember my best friends older sister had the film and we used to watch it and feel very grown up! I went to a 90s party a few months back as Cher! This look is perfect! Such a timeless Halloween costume, and that yellow plaid is a perfect piece for dressing up as Cher! such a fun and creative halloween costume idea! I'm a Clueless fan also and this would be a fabulous costume! so genius! and all the pieces could be worn separately too even after halloween! Haha you can never go wrong with an outfit from Clueless! That yellow plaid is iconic! Oh my gosh I love Clueless :) Gotta do this for Halloween one year! I am super in love with the skirt and shoes, they are perfect. I recently bought a tartan skirt which reminds me of the movie Clueless. this is such a great costume idea, i <3 cher! Clueless is one of my favorites too!!! I love this costume idea. You nailed it with the plaid skirt. I love this costume idea! I have thought about it, but I don't want to buy any clothes for it. It's a great idea though! I love this costume idea! I would totally rock this if I still had my long hair! Fellow Clueless soul sister! haha The print of that skirt is spot on! Love it! What a good idea!! I'm seriously struggling with ideas! The BEST costume idea! I love it. I have never thought of being Cher for Halloween, thank you for the idea!